Artwork Panel: 32.2cm x 83cm ≈ 12¾" x 32¾"
Silk/Brocade: 41.5cm x 142cm ≈ 16¼" x 56"
Width at Wooden Knobs: 50.5cm ≈ 19¾"
The first two Kanji alone mean immobility, firmness, fixed, steadfastness, motionless, idle. The last Kanji means heart, mind, soul, or essence. Together, these three Kanji create a title that is defined as "immovable mind" within the context of Japanese martial arts. However, in Chinese it would mean "motionless heart" and in Korean Hanja, "wafting heart" or "floating heart". This is one of the five spirits of the warrior (budo), and is often used as a Japanese martial arts tenet. Under that context, places such as the Budo Dojo define it this way: An unshakable mind and an immovable spirit is the state of fudoshin. It is courage and stability displayed both mentally and physically. Rather than indicating a rigid inflexibility, fudoshin describes a condition that is not easily upset by internal thoughts or external forces. It is capable of receiving a strong attack while retaining composure and balance. It receives and yields lightly, grounds to the earth, and reflects aggression back to the source. See our Immovable Mind custom Japanese Kanji wall scrolls page for more custom Japanese Kanji calligraphy options. 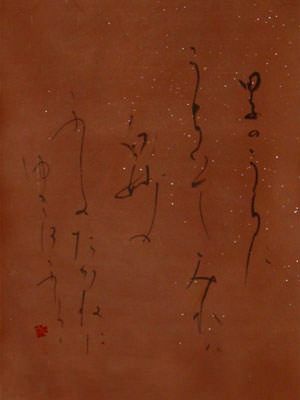 Japanese Master Calligrapher Bishou Imai. Bishou was born and raised in Nara, Japan. 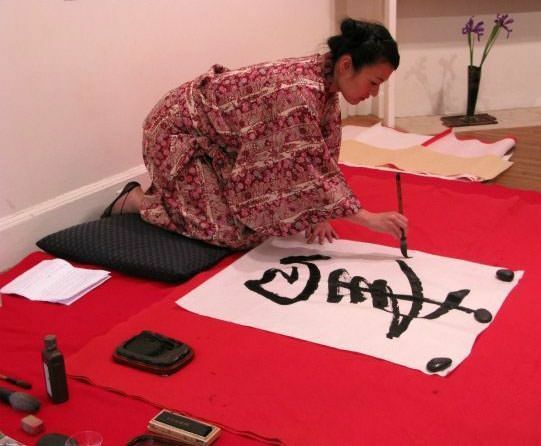 She began her studies of Calligraphy at the age of four at Baikou Calligraphy School. When Bishou was 25 years old, she received a membership to the Tenshin Kai (calligraphy society) and her life as a calligrapher began. Bishou progressed to the next level, becoming a member of the Cho-ko Guild which is the most prestigious calligraphy society in Japan. During her apprenticeship, she taught calligraphy and studied the art of Japanese silk scroll making (hyougu) at Mizuno Hyougu-ten. In 1998, Master Calligrapher Bishou Imai was awarded the highest rank in Japanese Calligraphy of Shihan. 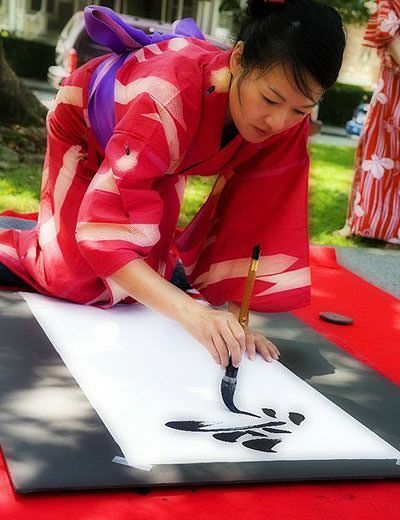 She currently holds a guild license for teaching both calligraphy and instructing teachers to teach calligraphy. Bishou Imai is among the few to have won multiple best of category awards in national competitions (Japan). Her work has been displayed at the Tokyo Metropolitan Art Museum, Osaka Municipal Museum Of Art, Nara City Museum Of Art and Kyoto Municipal Museum Of Art. 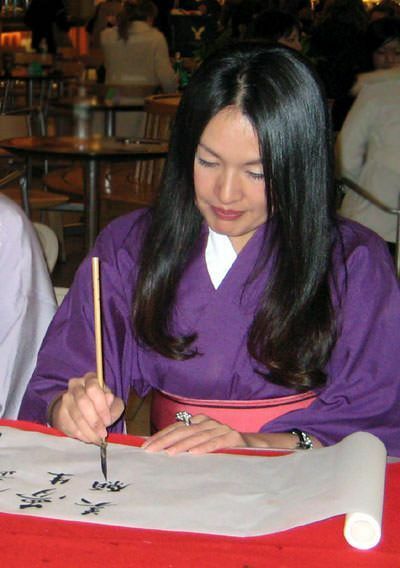 In Addition to being a calligrapher, she is also an "artisan artist" (Hyougushi). is how Bishou is written. This name means "Beautiful Cliff/Mountain". You will see these characters signed just before the red signature stamp on her calligraphy pieces. 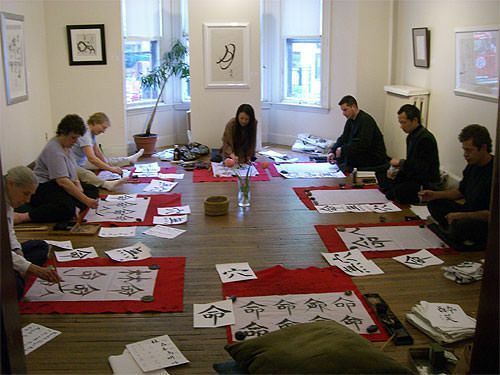 Master Imai, holding a Japanese calligraphy class in Boston.